While medical dermatology and surgery focuses on the diagnosis, treatment, and prevention of skin disease, there is a significant aspect of dermatology directed towards improving a person’s appearance. 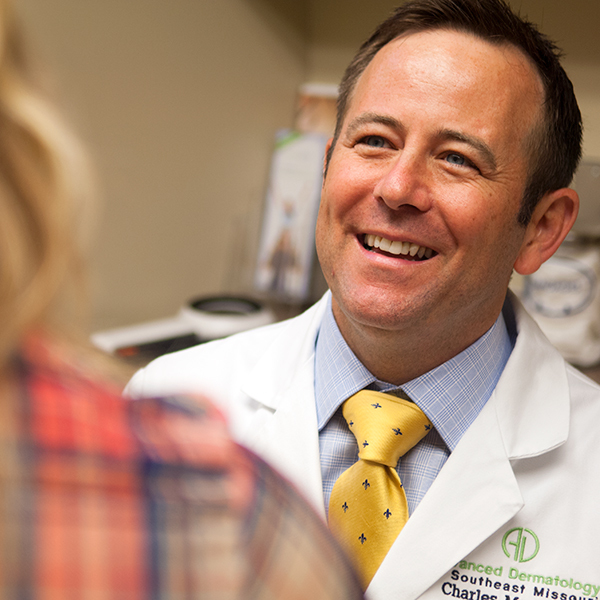 At Advanced Dermatology of Southeast Missouri we offer minimally invasive cosmetic procedures, performed in the office, with little or no downtime. We understand that choosing the right cosmetic procedure can be overwhelming. Consider a private consultation with Dr. Moon or Dr. Limbert, to assess your cosmetic concerns and create a plan individualized to you, considering your skin type, schedule and budget. Additionally Shine Medical Aesthetics located adjacent to the practice offers various cosmetic procedures in a relaxing, spa setting performed by one of our licensed aestheticians. To see what services are offered at Shine Medical Aesthetics, please click here. Botox is a prescription drug that is injected into muscles to reduce frown lines between the eyebrows, wrinkle lines on the forehead and crow’s feet lines around the eyes. This medication safely relaxes facial muscles for four to six months, giving you a more rested and youthful appearance. At Shine, we offer all three brands of Botox available for injection in the United States: Botox, Xeomin and Dysport. Fillers are natural substances that are injected to add volume and smoothness to the skin. This treatment is ideal for correcting facial wrinkles and folds in areas around the mouth and nose. Fillers also can be used to augment areas of facial volume loss like the temples and cheeks. The effects typically last from six to twenty-four months, depending on the type of filler and area injected. At Shine, we have a variety of fillers to customize your treatment, including: Juvederm Ultra, Juvederm Ultra Plus, Voluma, Belotero, Radiesse, Restylane, and Restylane Silk. The Vanquish is a non-invasive, non-surgical procedure for fat reduction. Vanquish treatments are safe for all healthy patients who want to reshape their bodies and improve those problem areas when exercise and diet have failed. Vanquish is designed to permanently lose unwanted inches from those trouble spots such as abdomen, flanks, back, saddlebags, as well as inner and outer thighs. Experience results as soon as the first few sessions with no downtime between treatments. The miraDry treatment is a quick, non-invasive procedure that permanently reduces or eliminates sweat and odor glands. Because the sweat and odor glands do not regenerate, the results are lasting. You can expect to see sweat reduction immediately, with minimal downtime after treatment. Superficial chemical peels renew the skin by increasing skin tone, reducing fine lines and wrinkles, smoothing overall skin texture, and by fading areas of dark discoloration. Additional, these peels are often used to clear acne prone skin. Superficial chemical peels typically employ glycolic or salicylic acid in varying concentrations with minimal downtime. These are typically performed by one of our trained aestheticians and may be used in a series to achieve the best results. Trichloroacetic acid (TCA) peels exfoliate and renew the skin on a deeper level for longer lasting results. This peel may be applied broadly to the face and neck, but is also used to spot treat problem areas like a chicken pox scar. The depth of these peels can be adjusted by applying more coats, making it an ideal treatment for those who prefer less peeling sessions at the cost of moderate downtime. These peels are performed by Dr. Moon and are ideal for severe sun damage, freckles or sunspots, deeper wrinkles, acne scarring, and large pore size. Using one of the most advanced IPL lasers called the Sciton BBL, we focus on skin conditions caused by aging, genetics and sun exposure. This treatment has no downtime and can target redness, blood vessels and brown spots on almost any area. Treatments are customized to match your skin condition and desired results. It is an ideal treatment for rosacea-prone skin, individuals who flush easily or areas of discoloration caused by sun damage. At Shine we use Intense Pulsed Light (IPL) to provide safe, rapid hair reduction. This laser targets hair follicle roots deep within the skin, selectively destroying them while leaving surrounding areas unaffected. This treatment is ideally suited for dark, coarse hair on the bikini area, face and extremities. Skintyte procedures utilize a laser to deliver special wavelengths of light energy to areas of skin laxity and sagging. This beam of energy penetrates down into the deep layers of the skin to stimulate collagen production. These new collagen proteins contract and tighten the skin from the inside out. This treatment is ideal for loose skin around the eyes, cheeks and neck.